We were told that a couple of days in Athens would be enough—and it is, because there is little beyond the Acropolis with its hovering Parthenon, to intrigue visitors. The Parthenon, however, can fill a significant amount of time. 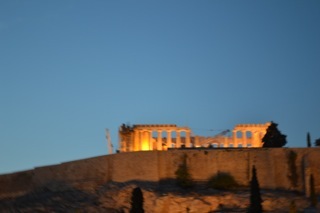 Our first night we ate dinner on a hotel terrace with the Parthenon, on its steep “sacred rock,” looming over us. The next day we spent at the Acropolis Museum, an architectural model for how museums should be designed. Parthenon by the British in the early 1800’s. The Elgin Marbles, now displayed in the British Museum, include pediments and friezes that largely defaced the Parthenon. Greece has demanded they be returned. Britain has maintained that Athens does not possess a museum adequate to hold them. Voila! The Greeks built a new museum to hold their heritage—and it is a marvel. 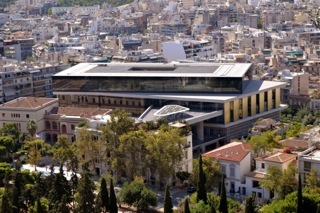 The building is glass with wide open spaces, much less crowded than portions of the British Museum, with a third floor oriented in the same direction as the Parthenon. Now the British are arguing that returning the marbles to Greece would set a precedent for other works the Empire obtained. (And it probably would!) 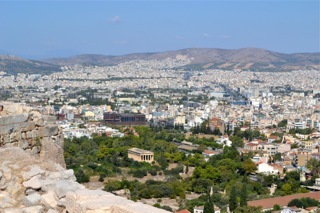 Our trek up the imposing hill to the Acropolis the following day was greatly enhanced by having visited the museum. the Unknown Soldier just in time for the changing of the guard. 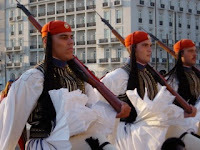 “It is worth seeing,” he assured us—and it was--with the choreographed balletic movements of soldiers, in uniforms copied from the days when the Ottomans occupied Greece. Athens was for centuries dedicated to Athena in her many forms. I can’t help but wonder what life for women was like when the major deity was feminine. Our time in Athens is ended, so I will carry that question on to Rhodes and then to Crete.